we were to make a multi-fold card. I decited on a triangle tri fold card. Beate has a great tutorial on SCS. The finished card is a 3.5 inch square when folded. I received this cute image from a image pay if forward thread over on SCS. I am sorry, but I am not even sure what the name of this stamp is. I believe it is called "love conqueres", but I am just not sure. For the inside I used a couple of stamps from "Critter Party". I was in the mood for some purple, since I very rarely use it. So I went looking for a designer paper with purple. I found this DCWV paper pack that had several different ones to choose from. The image was colored with alcohol markers (blick studio, prismas and copics). I sponged a little bit of bashful blue and green galore on the background of the stamped image too. Punched out flower was covered with stickles. I also added some stickles to the swirls of the designer paper. 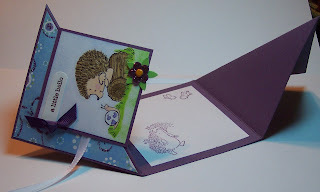 Thanks for stopping by my blog - wow I love your Triangle fold card - thanks for sharing the tutorial details - am gonna have a look at that! card Ellie, I love the triangle fold. Great image and the papers are gorgeous. Too cute and your coloring is great! That is an amazing fold, love the colours and the image. Oh wow Ellie what an adorable card, - love it. 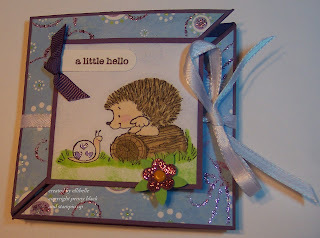 Fabulous card, wonderful colours and sweet image. Love that style of card. Wonderful card for the PB challenge. Have a very merry Christmas and a creative New Year. Fab card! Love the fold - will definitely give this a try! I just love the way that card unfolds! I am really going to have to be more rather more creative and do some folds like these!